Well now I think I can. The insight needed comes from a non related paper on the effect of knocking out the sweet taste receptor in mice. And in particular from this next set of graphs. They are interesting because they cover two complete days in the CLAMS equipment. Look at the grey and the black lines first, these are control and sweet receptor KO mice, being fed pretty standard low fat crapinabag. 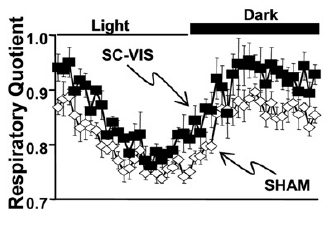 We can see that between day one dark period and day two dark period in the CLAMS equipment that a) the peak height of the RQ rises, b) carbohydrate oxidation rises and c) lipid oxidation falls. No one did stats to compare these two days with each other so I don't know what the p value might be, but the trend certainly looks very real to me. No one altered the food macros between day one and day two. I think mice, like humans, cut their calories when you put them in to a respiratory chamber or in to a CLAMS apparatus. Certainly for the first two or three days of mice in CLAMS. In this T1R2 KO study you can see evidence for the the improving intake of (carbohydrate based) food between day one and day two which is inseparably linked to the rising RQ. There had been a day of acclimatisation before the two study days which will have minimised this trend but it's very much still visible. The change is less obvious (but still present) for the fat fed mice (red coloured traces) but it's not so clear cut in these mice because they are largely either oxidising fat from their diet or fat from their adipocytes, both of which look pretty much the same from the RQ point of view. Core insight. You can alter RQ away from the macros of a (high carbohydrate) diet by simply eating less. Adipocyte fat makes up the difference in calories and this automatically drops the RQ. 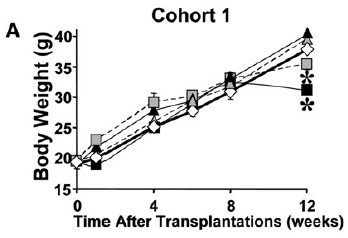 Let's take this idea and look at the RQ figure from Kahn's paper. 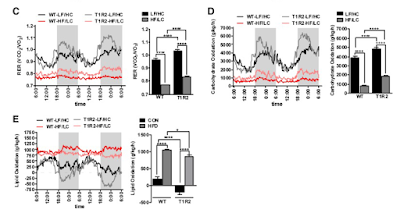 In a normal mouse, on normal low fat chow, the RQ during the early feeding period rises to above 1.0 due to de novo lipogenesis combined with fat repletion/storage. Kahn's control mice (SHAM) started with a RQ at around 0.88 and they slept through the light period so dropped their RQ to around 0.75. When they started to feed with the arrival of the dark period (on their high carbohydrate chow) in the CLAMS apparatus the RQ only rises to 0.88. In real mice eating this sort of chow the RQ should rise to 1.2 for a few hours. The RQ will not rise to 1.0 if the mice fail to eat enough carbohydrate to meet or exceed their energy needs. If they don't eat enough they will continue to utilise body fat and this will lower their RQ below that of a mouse eating to weight stability. 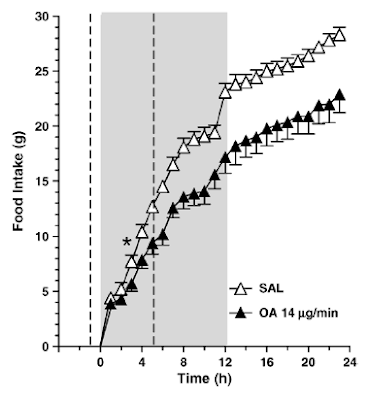 These mice did not eat enough carbohydrate to suppress fat oxidation. The RQ says so. The absolute food intakes are below but these are fairly irrelevant compared to the RQ data. They were put in to the CLAMS apparatus with no suggestion (in the methods) of an acclimatisation period. I think the mice were frightened and dropped their food intake. 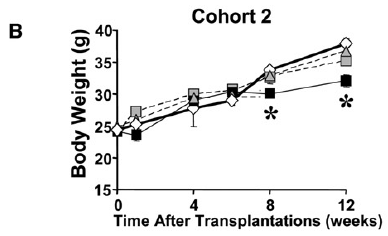 We can see from the RQ of both groups that at no point does this even approach, let alone exceed, 1.0 (in the acclimatised mice in the T1R2 KO paper figure the RQ reaches 1.1 at the peak of feeding on day 2, ie CLAMS day 3). Summary: Both of Kahn's groups are oxidising fat to give a low RQ on an high carbohydrate diet and the only way they can be doing this is if the fat is coming from their adipocytes. They are not eating enough of their carbohydrate based diet to maintain fat storage or to raise the RQ. The white diamonds are still the controls/sham operated. They carry about 10g of fat at week ten. The black squares are the intervention group, they carry about 5g of body fat at this time. If both groups cut calories acutely during their day of anorexia in the CLAMS apparatus, I would expect the animals with the most adipose tissue to release the most FFAs. And oxidise the most FFAs. That has to be the control group, because they're a lot fatter to start with. The intervention group has less stored fat available, so oxidises less fat. Interestingly the fatter control group ate 3.9g of carbohydrate based food in the CLAMS vs 4.2g for the slimmer intervention group (ns), which just might reflect less hunger in the fatter control mice because they are accessing their bigger fat stores, ie the control mice appear to run on fat (because they are doing so on this one single day). A lack of stored fat in the intervention group is why they ate more (carbohydrate based) food and utilised less adipose derived fat. So this group appears to run on carbs, judging by their RQ. But the RQ over the rest of their lives, in either group, while eating normally, to satiety, outside the CLAMS apparatus, is a mystery. But yay! The CLAMS equipment is almost certainly working correctly. The RQ graph is very explicable. It probably tells us NOTHING about the substrate oxidation under non-CLAMS conditions, but we can speculate about that in another post. Trying to make inferences about overall post-intervention metabolism, based on a single day in a very novel (and possibly frightening) environment under acute hypocaloric conditions will set you up for a hiding to nothing as far as comprehension and understanding of your intervention are concerned. But given enough thought the results at least become comprehensible. I picked up this paper via Face-ache so cannot recall to whom I should credit for the find. Sorry. The post is also highly speculative. "... perceived hunger (ie, the susceptibility of eating in response to subjective feelings of hunger)"
So NEs may not eat any more than non-NEs when they are "subjectively" hungry. My argument is that they are simply hungry more frequently, including right through the night in fact. *Aside: But they are learning! 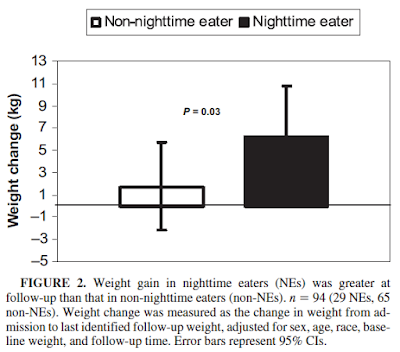 Quote of the century from the paper: "These differences in substrate oxidation and SPA indicate that the night eating behavior phenotype may have physiologic underpinnings"
OMG gluttony may just be physiology!!!!!!!!!!!!!! End aside. Why might NE people be hungry more often than non-NEs? From the adipocentric view of obesity, when dietary fat falls in to their adipocytes and stays there, NE subjects "lose" this fat. In the absence of a decent supply of metabolisable fat there is nothing left to oxidise except carbohydrate, with its high associated RQ (pax protein). Once the bulk of the ingested carbohydrate is metabolised and the fat is in the adipocytes for the duration, there is nothing for it but to get some more carbohydrate to eat and metabolise. The signal for this need to eat is called hunger. The fat loss phenomenon is not huge, the RQ for NEs is 0.85 and for non-NEs is 0.83. But I think that is enough. Eating another mixed meal or mixed macro snack supplies necessary glucose for oxidation but the fat is again "lost" in to adipocytes. This keeps happening. So. Are these folks going to get heavier? Of course they are. That is intrinsic to the elevated RQ compared to non-NEs while eating a similar macro ratio diet. It can only occur during fat accumulation. People with high RQs gain weight over the years. The high RQ is a direct result of the loss of dietary fat in to adipocytes. From the respiratory chamber study it would be about ten grams of fat per day "lost" in to adipocytes. In the background paper the NEs weight gain over 3.4 years was actually roughly five grams per day rather than ten grams per day, but people are more active when outside a respiratory chamber! Obviously fat "lost" in to adipocytes is fat gained on the scales. Are NEs insulin sensitive or insulin resistant? This is by a different group. They are less psychiatric in outlook but fail to perceive that obesity might be a significantly adipocyte related problem. They mention stomach and liver and circadian rhythms, but not adipocytes. Their data are a little shaky but certain features come through as plausible. They measured a ton of (mostly) hormones but the only two parameters which grab my attention are insulin and glucose. Now, the x axis is as clear as mud (like much of the rest of the paper). It really is "time of day", sort of. The first sample was taken at 8am, this is the start of each of the graphs, eight is interpolated between six and ten. Twenty four hours later, 8am next day is at 32 on the x axis and we get an extra data point taken at 9am on the second morning, ie 25 hours in to the study, it's at 33 on the x axis. Simple huh? Sorry if I've insulted the clarity of mud. Three meals were served during daytime and snacks were available and consumed ad-lib, including through the night if so needed. Solid lines are controls, dashed lines are NEs. Macros of intakes were not controlled. Control group (non-NEs) eat through the day. 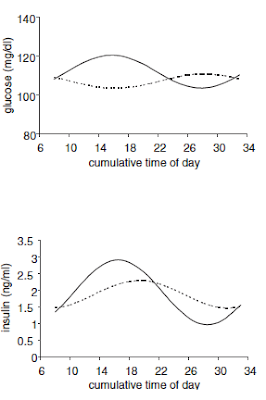 Glucose and insulin peak at around 5pm, probably around evening meal time, and both trough at around 4am because these folks would like to sleep through the night (they were blood sampled once an hour so...) and don't eat while asleep or wanting to be asleep. The insulin peak is lower for the NEs as (I am assuming) they are insulin sensitive so they easily distend their adipocytes. 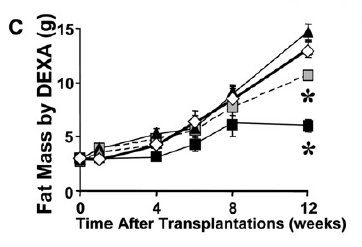 Insulin sensitive adipocytes need less insulin to squirrel away diet derived fat. The insulin peak is delayed because these people are NEs, nighttime eaters, by definition. Eating later gives a later insulin peak. The NE insulin curve also never shows that drop in the early hours because NEs continue to eat at night. Because they're hungry at night. That's why they are called... You get the gist. The glucose curve is equally explicable in terms of pathological insulin sensitivity. Just a little insulin lowers the blood glucose and facilitates its oxidation (daytime dip in glucose) and facilitates uptake in to adipocytes to generate glycerol for triglyceride sequestration. Gradually falling insulin due to lower (but not zero) food intake in the early hours of the morning allows some recovery of blood glucose levels, probably assisted by the surge of growth hormone in the early hours of the morning with its mild glucose raising, insulin resistance effect. 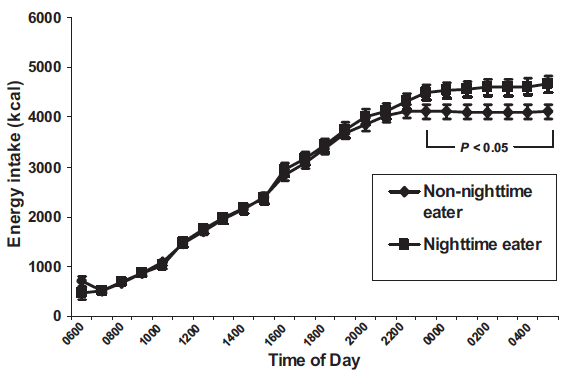 Night Eaters are pathologically insulin sensitive. Like the Laron dwarf humans and Laron mice, extreme insulin sensitivity causes obesity, given ad lib food. 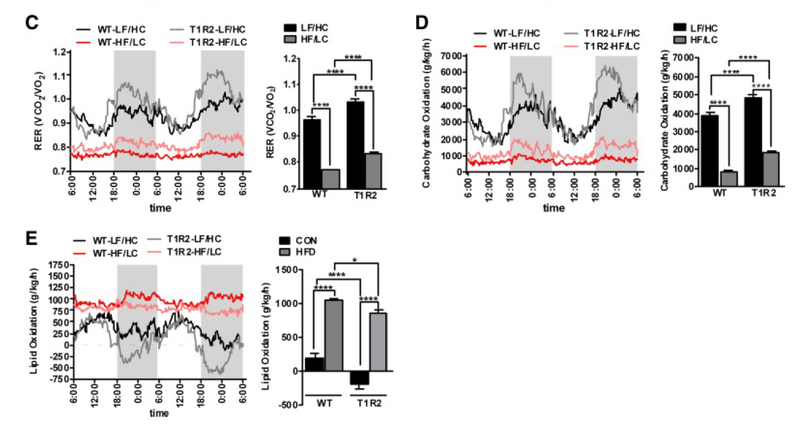 Unlike the Laron individuals with their genetic oddity of long term preserved insulin sensitivity, NE people will eventually distend their adipocytes to the level of leaking free fatty acids. But until their adipocytes become dysfunctional NE people are insulin sensitive, hungry, and lose the fat component of their diet in to their adipocytes. Of course, once their adipocytes become distended and start to leak FFAs they will stop getting fatter and start to access the spilled fat. Oxidising this will drop their RQ but they will at this time become IGT/diabetic due to unregulated and inappropriate FFA release. If I had to suggest an explanation for NE patho-physiology it would be PUFA, mostly linoleic acid... I'd expect NEs to be people who avoid saturated fat and prefer corn oil, over the long haul. More victims of the cardiologists.